Cooler today, and supposed to dip into the high 40's overnight, ah yes, my kind of weather. Today's card is a stamp by Rubber Cottage. Embossed paper was put through a cuddlebug folder, love those folders! 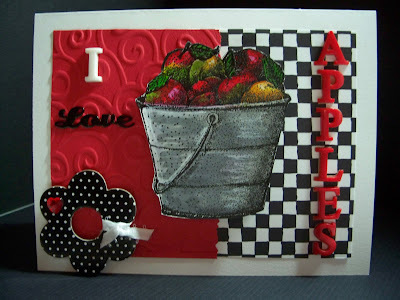 I like the combo of red, white and black, and don't those apples look delish. Maybe I need to visit the local market this Thursday!